Romantic and happy winter in Kyoto! Enjoy a great dining experience with a great atmosphere with your friends and family! Christmas and New Year are approaching fast, and of course, this means spending time with your important ones. 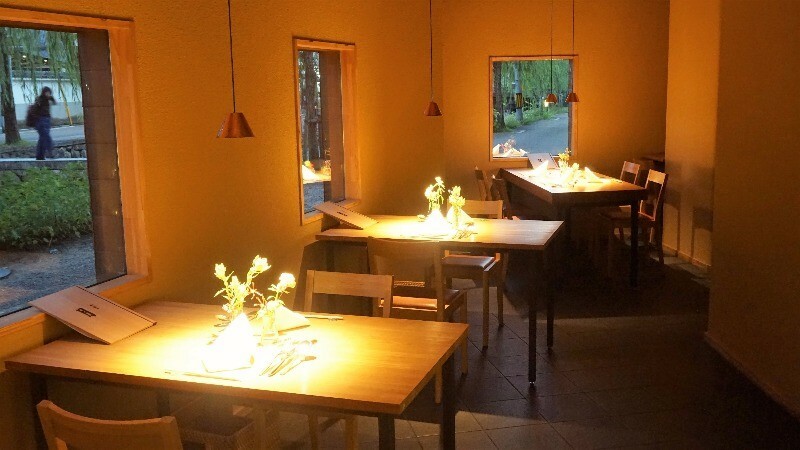 And when it comes to spending time with your loved ones, what better place for it than in a nice restaurant? So I have here for you a café with a great night view, a restaurant great for a girls’ night out, and even a steak place that is a bit on the fancy side. I’m sure these restaurants are going to leave you feeling very satisfied! In the Soup is a restaurant-pub well-hidden from the public on the 9th floor of a building in Gion. Inside the restaurant, however, looks very American so you get to view the night view of Kyoto’s Shijo Street from a pub where you feel like you were back in NY. 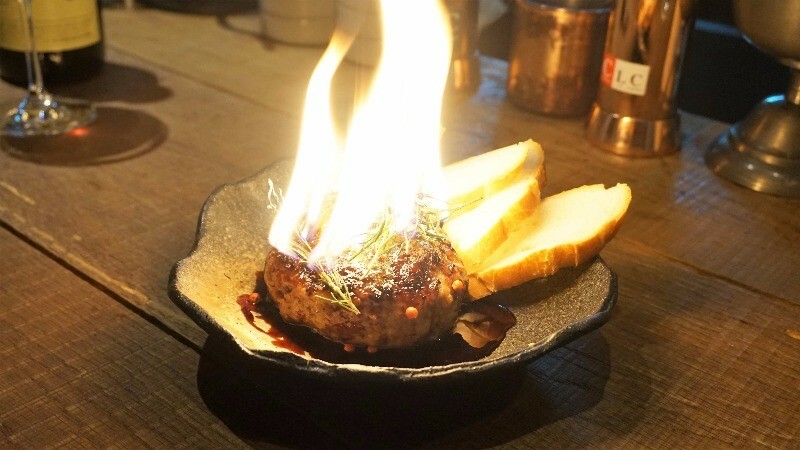 And the main event of the night here has to be this Hamburg steak, which they light up in flames. The steak is topped with rosemary which when burnt releases a really good smell. 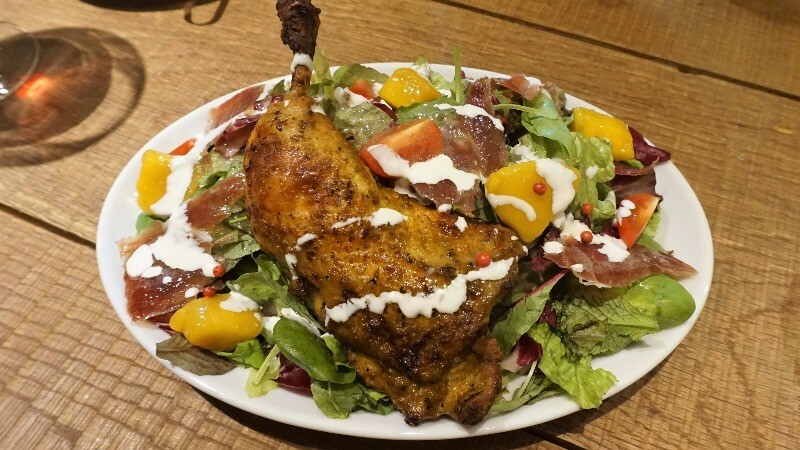 Another thing worth mentioning is their prosciutto and tandoori chicken salad. The portion is big and you even get mango with the salad, so it’s the perfect starter for your party, especially if you have like three or five members in it! 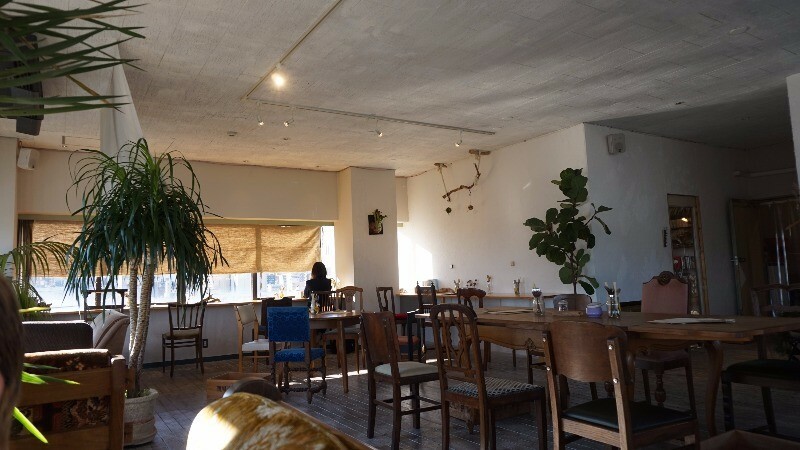 Mar Café is located on the top-floor of an office building not too far from Kiyomizu-Gojo Station, and they are open from lunch to midnight. The interior of the café is simple and they have many sofas for you to sit on and gaze at the Kamo River down below. 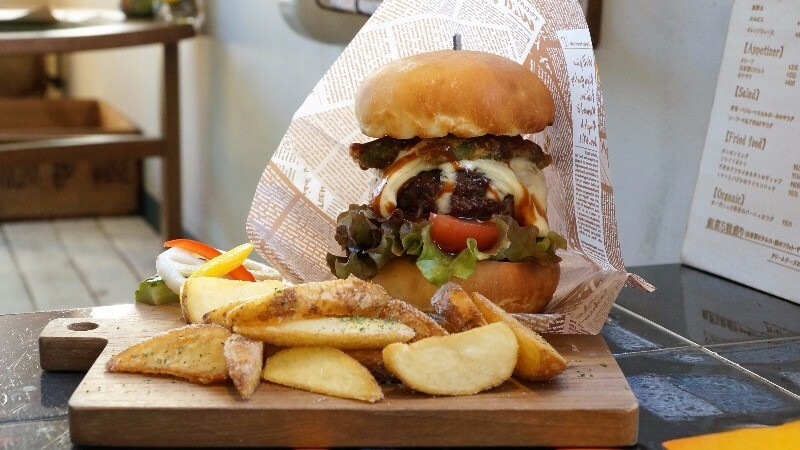 They are the most famous for the hamburger which carries the name of the café, their Mar Burger. They only make 10 a day, and there is a lot to eat in one of these burgers, with the melted cheese and big patties. This burger is liked by children as well as adults. 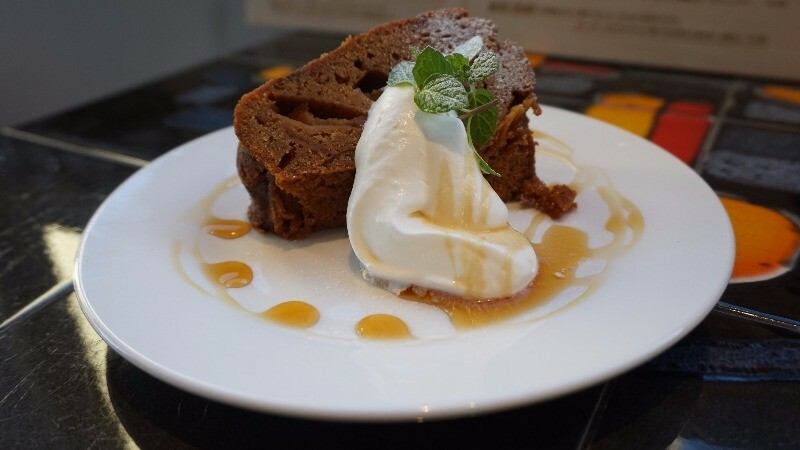 They also offer handmade desserts like cakes, so be sure to order a dessert too. They also have seats outside too, and from their terrace area, you get to see the whole of Higashiyama below you. 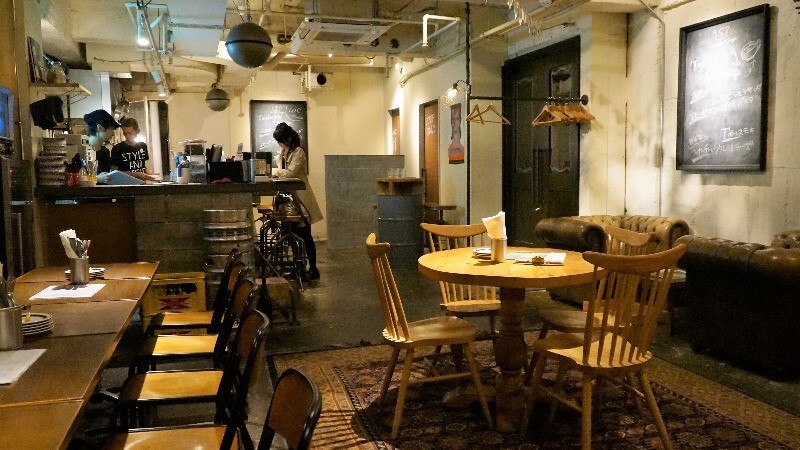 This is café is also great for bigger groups families with children. At Kiln most of their food is grilled on firewood, giving it an especially nice taste. 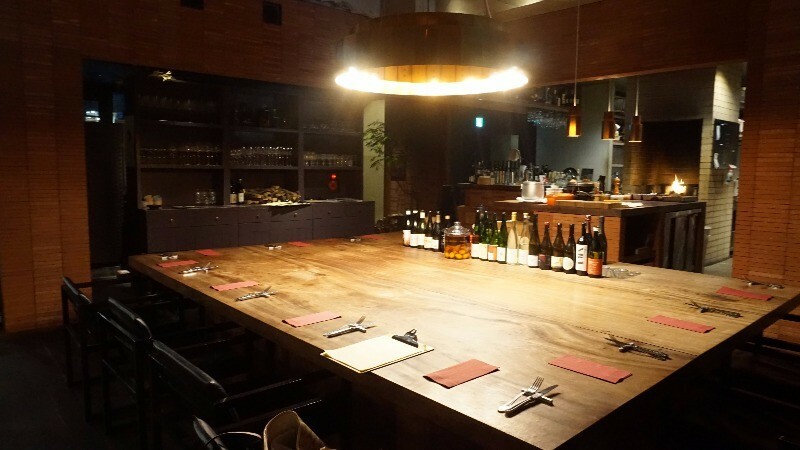 The restaurant is located in the famous bar district of Kyoto, Shijo Kiyamachi, and it looks trendy from both inside and outside. Inside they have a huge wooden counter table, and while the main attraction here are the steaks they also serve all kinds of other dishes and have an extensive drinks menu. They use meat from the Taoshita cattle in Hiroshima, and the smell and of the grilled meat is even better than normal because it’s grilled on firewood. 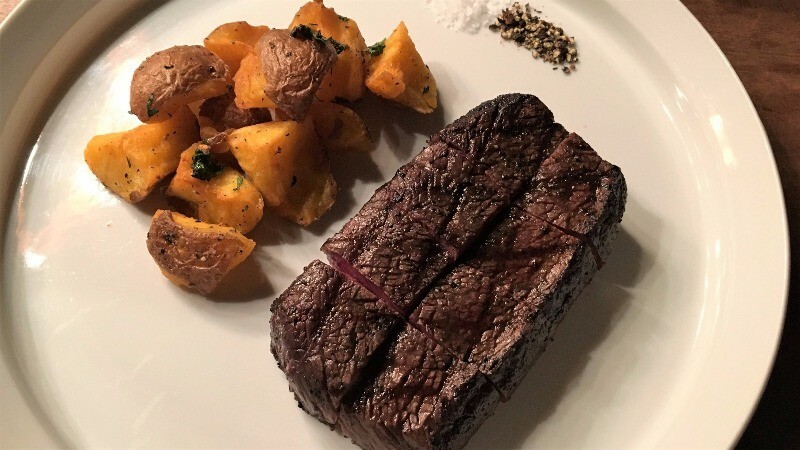 The juicy steaks are perfect to be paired with red meat. 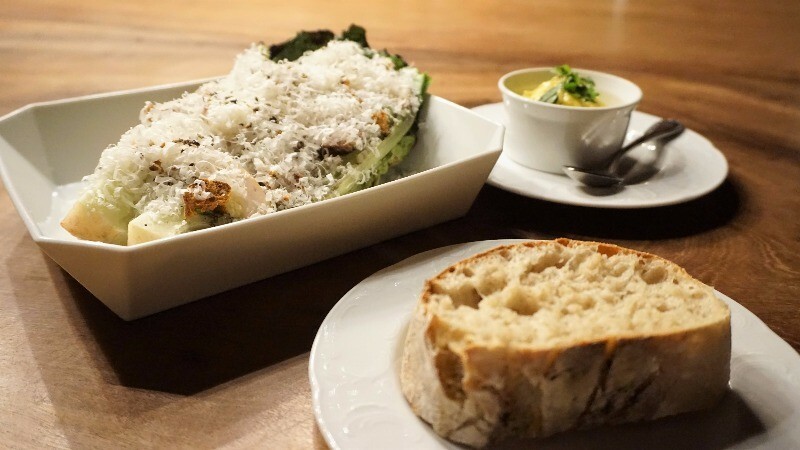 In the picture, you can see grilled caesar salad with smoked Tankai chicken, and the vegetables are so good that I could eat them without dipping them in the sauce at all. But the salad dressing you get with this is also very good and thick, and the taste complex. The food here is on the healthy side of things, so this restaurant is great for couples or a girls’ night out. 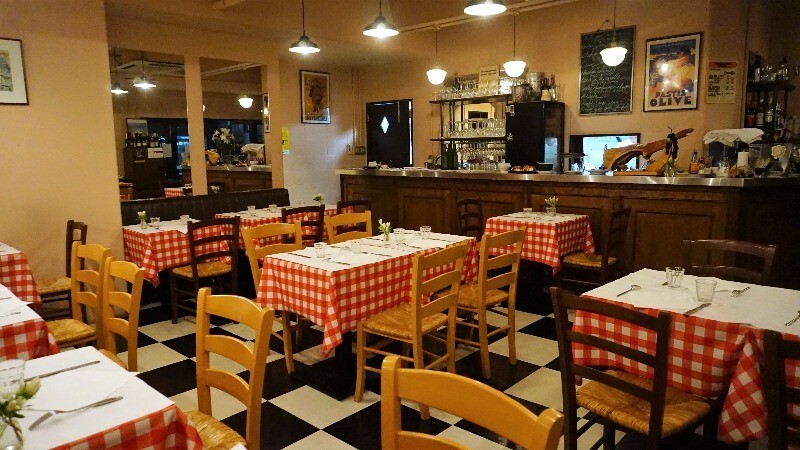 Right away when you step inside Le Bouchon, you know you’re not in Kyoto anymore. The restaurant located in a quiet alley close to the Kyoto City Hall is so French it feels like you were back on the continent. 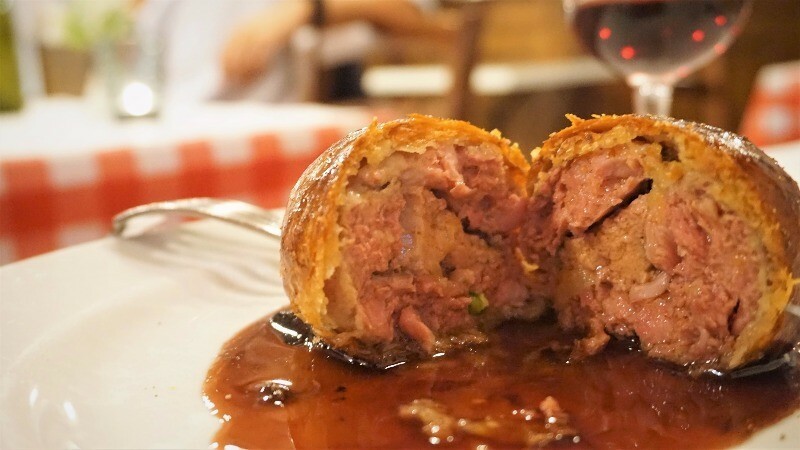 French cuisine has an image of being very expensive, but at Le Bouchon, you can enjoy it at very reasonable prices. If you look at this pie here, it doesn’t only contain pork, but also chicken, and one of the most famed culinary luxury items, foie gras. This ingenious dish cooked up by the skillful chefs of Le Bouchon is something that has to be had with a glass of red. If you dare to eat raw meat, then this is something you have to try. 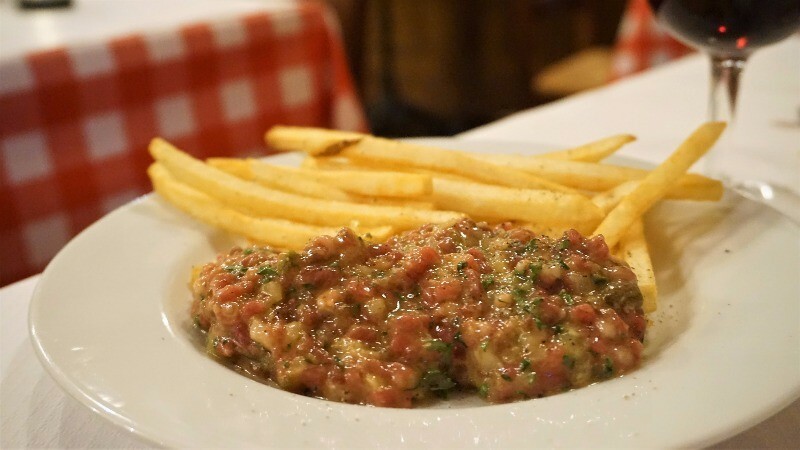 This dish is prepared right in front of you, as the waitress mixes the horse meat tartare with some very nice sauces. This restaurant is the choice for those of you into French cuisine, but who maybe don’t want to go to the more expensive restaurants. Last I have for you a fancy steak restaurant by the Shirakawa River and Chion-in Temple. 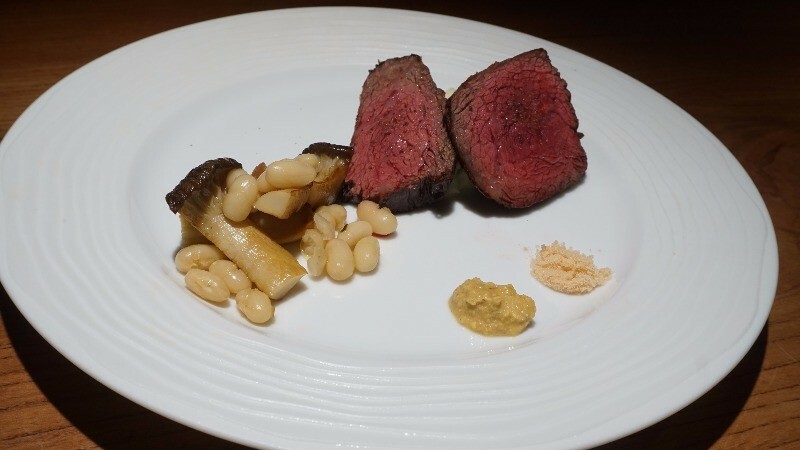 This restaurant is run by one of the most traditional butchers in Kyoto, and by opening this restaurant they want to let people have a chance to enjoy the different cuts of steak. You even get to eat some parts of the cow you wouldn’t normally have a chance to try, and the atmosphere is very romantic. For the absolutely best cuts, you don’t need any sauces; you just enjoy the taste of the meat. Part of the menu changes daily, so ask the waiter for the day’s recommendation! One of their specialties is pasta, which contains more meat than it does noodles. 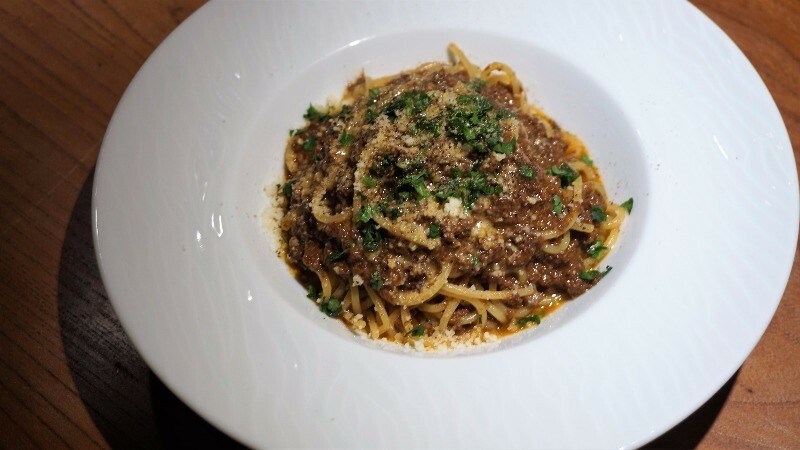 The beef used for this pasta is of an exceptional quality, and it’s hard to tell what you’re eating: meat sauce or pasta? I’m sure that you will spend the beautiful night eating the great, not of seen, dishes and drink some red wine! Christmas and New Year’s holidays are not the only things December has to offer, and I would like you to enjoy some dinner in Kyoto too during this romantic period of the year. All the above-mentioned restaurants are great for some Christmas dinner, so I hope you’ll choose one and actually go to it! December in Kyoto means presents and a warm atmosphere, and no matter with whom you decide to spend your Christmas, Kyoto has something to offer for you. I hope you can now see that Kyoto is not only temples and traditions but also a city bustling with life all through the year! Part 2Exchange presents! Give your most important ones romantic gifts! Part 3Christmas lights and other illumination events that paint Kyoto in a magical light! Part 4Enjoy a great dining experience with a great atmosphere with your friends and family!